Part II of Riding the Five-Boro on Two Cargo Bikes coming soon! We would likely not have gone for it if another local bicycling family hadn't asked if we wanted to join them and create a team to go into the lottery together. Riding around all five boroughs of New York City sounded extremely cool, but there would be tons of logistics to figure out, including just how we were going to get our cargo bikes from New Haven to New York City and back again. Oh, and 40 miles? Yes, we ride around nearly every day but we weren't ones for tracking our mileage. Just how would 40 miles feel when it was all said and done? 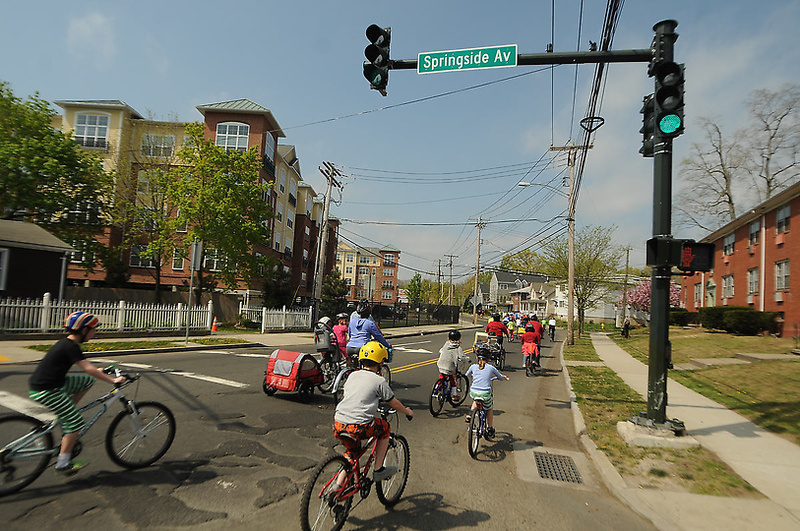 With 32,000 riders The Five-Boro Bike Tour is a huge ride. In fact, it is my understanding that this is the first year Bike New York went to a lottery for registrants given that they had capped the numbers of bicyclists who could participate and it had sold out within hours last year. But P and I didn't know any of that, we just said, "Sure!" when our friends asked, and so they went online and filled out our lottery registrations. Weeks later we received emails confirming that we got the thumbs up and could now register for the actual ride. I was a bit taken back by the cost of our family's total registration fees (pricey!) but I figured that the funds were going to a good cause furthering bike education and advocacy in New York City and this would be a one-of-a-kind family experience. I will add that when I was riding, the enormity of the logistics it took to pull off the Tour struck me, a realization of the amount of people and cost it must take to plan and run the ride. 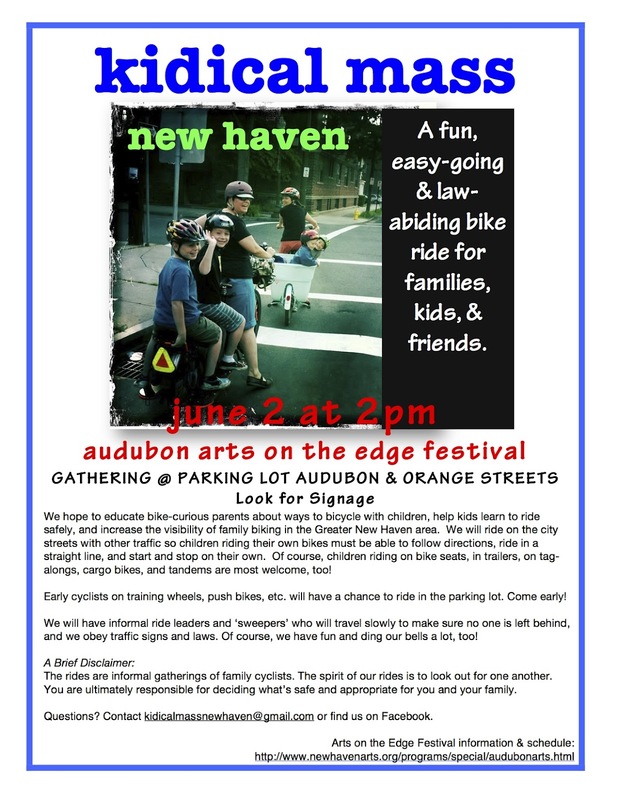 I should note, too, that one can ride for a charity without paying the registration fee (there is a fundraising amount participants must reach) or folks can also volunteer to work the Bike Expo and/or tour and be guaranteed a spot in the following year's Five-Boro. We began brainstorming ways we were going to get ourselves and our bikes to New York but hadn't settled on anything when just a couple of weeks before the Tour, we heard from the Ts that they had a big conflict and were going to be unable to make the ride. At this point, if P had said, "Sara, let's skip this," I have to admit that I likely would have agreed. When I shared my doubts with him, P reminded me that we had always been up for adventures, we met as Peace Corps volunteers, traveled a lot together, and had always expressed a desire to share unique experiences with our sons. 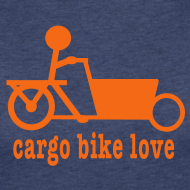 Another incentive came through the online cargo biking community. We had been following the incredible journey of the Pedal Powered Family and learned on the Facebook page of (R)Evolutions Per Minute that Heidi, Reuben, and their kiddos would be in New York at the time of the Five-Boro and hope to join the ride. Reuben and I ended up emailing and texting about meeting up and riding together. However, up until the Saturday before the Sunday ride, it wasn't clear if they would be able to get numbers to join the ride. 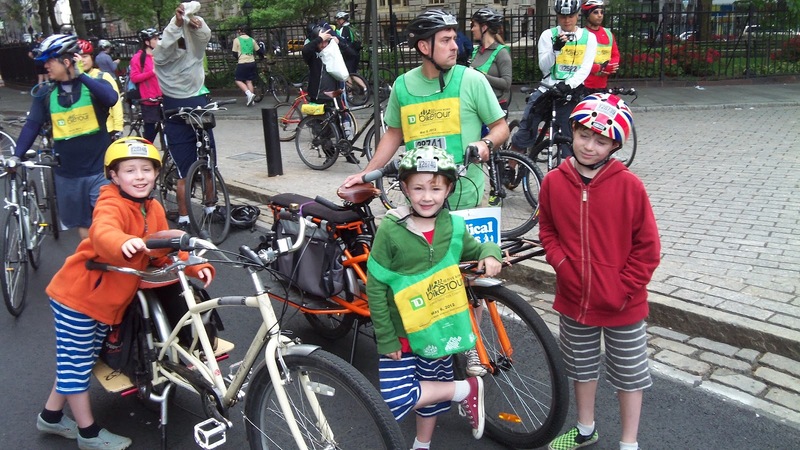 Thanks to a serendipitous turn of events when the PPF was at the Bike Expo, Reuben, Heidi, Harper, and Eden ended up with the official green bibs we had picked up the Thursday before. Getting the two longtails down to NY? Our minivan did the trick-- without any passengers or seats in the back. P loaded up the Yuba and the Xtracycle in the emptied back of the van, drove to the City, stopped by the Expo to get our registration packets, and proceeded to his brother's apartment on the Upper East Side. There, he unloaded the bikes and turned around and drove back to New Haven. Late Saturday afternoon, our family took the train to NYC. We ran out to the local grocery store and loaded up on snacks and tried to get the boys to sleep at a decent hour, rightly anticipating a long next day. The next morning, we affixed our official stickers to our helmets and bikes, slathered sunscreen on the boys and ourselves, and stuffed our Freeloader bags with water and food-- one huge advantage of taking on the Tour on cargo bikes. Donning the green participant vests and our bike helmets, we rolled the bikes out the apartment door and on to the relatively quiet 8AM Sunday streets of Manhattan. I got a real rush climbing on the Xtracycle Radish with one of the guys on the back, pedaling down to Lexington Avenue, and riding the six blocks to the subway station. This was a 'coming together' for me of some sort, being so comfortable riding our cargo bikes at home in New Haven but despite multiple years of living in NYC, this was the first time we were riding them in this place. The positive buzz quickly turned to anxiety though when we reached the subway station. First, we had to figure out how to carry these big bikes down the stairs. 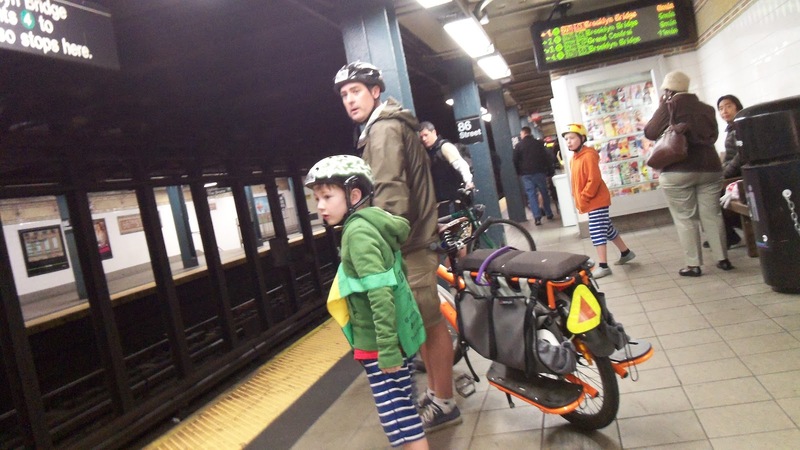 Then, we needed to get them on the train so we could get to the starting point of the Tour at the bottom of Manhattan. P managed to pick up the monster Yuba and carry it down the stairs his own, but when I tried to do the same with the Xtracycle, my arms buckled and I realized that I was not going to be able to pull it off alone. So we had the boys stand together down in the station next to the Yuba while Peter hustled back up the stairs so we could carry the Xtracycle down together. Given the relatively early Sunday morn, the station was not overly busy so we could swipe our Metrocards pretty easily and roll the bikes through the emergency gate without too much fuss. Likewise, rolling the bikes on to the train in the AM was not too bad considering their lengths, but we did split up and go in separate cars. We were not the only riders with bikes on the subway that morning so it helped alert other passengers that some sort of bike event was happening. Carrying the longtails up the stairs out of the station took the two of us two separate trips. We were both breathing a bit heavy when reached the top of the stairs the second time but it was fun to see the myriad of other riders emerging from streets around us, making their way to the start of the tour. May, as we know, is Bike Month. There seem to be loads of bikey news out there and one topic, in particular, has interested the Full Hands Family tremendously. Bicycling magazine recently-published article, Why Johnny Can't Ride and the NPR follow-up interview with the author, David Darlington, look at the sharp decrease of children walking and biking to school AND some school policies that actually prohibit kids from riding to school on their bikes. "According to its surveys, in 2009 only 13 percent of all children walked or rode to school, whereas in 1969 nearly half (48 percent) did. The remoteness of the new schools is not the only cause: Among students who lived within one mile of school 43 years ago, 88 percent walked or bicycled, while today only 38 percent do." It made me reflect on my childhood experiences and to look at what's happening with my boys. Due to my father's job, my family moved numerous times throughout my elementary and high school years. I lived in multiple towns in NJ, one suburb of Pittsburgh, PA, and in a Los Angeles suburban town for a lone school year. And you know what? I cannot remember my parents driving me to school. Ever. I suspect that it happened a few times, but we walked or took the school bus, depending how far away from school we lived. Given my numerous siblings, there was always someone to walk with and I can remember meeting up regularly with neighbors, becoming part of these packs going to and from school together. When we got home, we would hop on bikes and ride all around the neighborhoods, generally unsupervised, but always making sure to be home for dinner (you had to know my mother). My older fellows started preschool when we were living on a school campus in rural Maine. In order to get to preschool, driving was the only option. Moving to New Haven was a big change on many fronts and the twins spent their last year of preschool at a school within walking distance of our apartment. And we did-- we walked, and sometimes scootered, always pushing their two-year-old brother in a great hand-me-down jog stroller that had survived multiple cousins. The route took us up a big hill and at times, there were complaints, but we always seemed to get there. To distract the boys from complaining, P began a never-ending story of a cheeky squirrel that survived many adventures. When our little guy started at this same preschool the following year, P became the primary drop-off person and he often braved the steep hill by bike, F strapped in a Topeak childseat on the back of the 1968 Rudge Roadster. This, of course, was the year that we discovered cargo bikes. It took us until February before ours arrived so the older fellas and I went to school by car those first six months. But finally, finally -- with the arrival of our bakfiets, we became a bike-commuting family. And that was that. But not really. Because then our boys grew older and heavier. And we moved across town, doubling the distance of our commute. And this year, transportation to school has changed again. Our older guys now take a yellow school bus and the little one and I ride together. The school bus arrival time has forced our family to wake up a full half hour earlier each day but my twins love the experience of it-- perhaps, as my husband and I surmise, it is because it is the only time of their days that they are really unsupervised. Yup. If only every day, looked like this day. That's my older guys in the Nutcase helmets, riding with two of their classmates, right out there on the streets, enjoying this year's Rock to Rock Earth Day bike ride.